I liked this article, the Web 2.0 Backpack: Web Apps for Students (thanks Lifehacker!). The big players like Google Docs and Spreadsheets or Wikipedia are there, as you might expect. I am interested in checking out the note taking category because I’m curious to know how an online option beats Notepad. For my school, I recently installed Dansguardian web filter and Squid web proxy/cache. 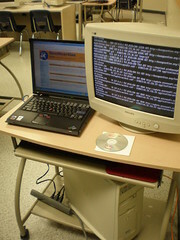 on the Dell desktop computer shown at bottom in this photo.The server is configured as an Ethernet bridge using Ubuntu’s bridge-utils package. That way, the machine is invisible on the network so I don’t have to reconfigure the clients behind the filter. John Rucker’s howto install DansGuardian was incredibly useful and my primary source. On the K-12 side of things, New Jersey Institute of Technology (NJIT) and Arizona State University (ASU) are providing a small amount of content for teachers and kids. NJIT is providing audio versions of public domain books, and ASU is providing a series called “Ask the Biologist,” tackling science issues for young learners. Apple would not comment on plans for expanded K-12 content in the future. Prior to this initiative, I was already a fan of UC Berkeley’s Physics for Future Presidents lectures available in iTunes. I love the idea of listening in on college courses. And now, with this dedicated area in iTunes, I can find more for myself and possibly use this with students. While listening to Grammar Girl’s Quick and Dirty Tips for Better Writing podcast, I learned about the chance to submit essays to This I Believe. Selected essays are read by their authors on NPR. I’ve heard the NPR program a few times and have been really moved by several of the essays. When I visited the NPR This I Believe site, I learned that the program is based on a 1950s radio show by Edward R. Murrow. Everyday Americans write about the principles that guide their daily lives. A good number of celebrities have written, as well. This I Believe, Inc. is the organization that runs the essay program. I think it’s cool that they’re reaching out to teachers with This I Believe in the Classroom. I think this could be a really cool project for a high school writing class. Lots of our kids hold very strong opinions — TIB lets them express those opinions in a public way. Thanks to 43 Folders for the link to this one: An Interview with Ze Frank. For a year, starting in March 2006, Ze Frank produced a daily video called The Show. I found episodes at times thought provoking or enlightening but always funny. Several episodes merited my showing them to high school students (see the one with Condoleeza Rice’s magic satchel). What impressed me about Ze’s show was his quick paced witty dialogue. How’d he create something this good every day? I can’t imagine the pressure to produce. There’s this thing I try to do that I call “brain surfing.” Do you know the technique “morphological synthesis”? There’s a really beautiful book by James L. Adams called Conceptual Blockbusting. It’s a book that was written in the ’70s on creativity. The idea is, you just start with a concept that’s immediate to you. I mean “immediate” in that you have some kind of direct emotional connection to it in that moment. And it can be as simple as a word. Maybe somebody pissed you off in line, or you’re worried that your toe is broken. And you just start with that and begin to associate things with it. It’s not really free association, so it’s not just anything that comes to mind. But you tell little stories to yourself that move you away from that initial concept. So if it’s your toe being broken, you start thinking to yourself, well, what would happen if something else was broken and you tried to drive a car? Then you move away from that and you think about the worst car race ever. Now you’ve moved into a demolition derby. And you just sort of work in circles. At different points you stop and relate wherever you are back to the original concept. And just play. Sometimes I write these things down on paper, and sometimes I just sit there and do them in my head. But for me, it’s a nice little play zone where you can find very weird and silly things. Reminds me a bit of the brainstorming techniques I learned in middle school. And I think “brain surfing” has cool implications for students.